The government through the Ministry of Energy and Mineral Resources (ESDM) continues to accelerate the program to provide gas network assistance to households, especially in areas that have natural gas resources. Until 2018, have been built 463,440 house connection (SR) of gas network for households. 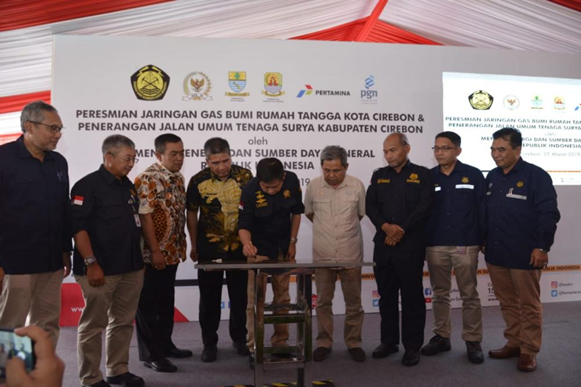 Thursday (3/21) in Cirebon, West Java, ESDM Minister Ignasius Jonan again inaugurated the use of natural gas for 3,503 house connection (SR) whose funding comes from the 2018 State Budget (APBN). "The government is committed to continuing to push and accelerate the Gas Network (jargas) program. Every year the Government issues APBN funds to increase household gas networks in various regions, so that more people will benefit greatly from the use of natural gas, in accordance with the President's mandate. enjoyed by local residents, "Jonan said in his message. Jonan added, the Government has just issued a Presidential Regulation for the construction of household gas networks implemented in 2020. "In 2020 and then one year if there is a budget of 1 million household connections per year," Jonan added. This is the second time that the people of Cirebon City have access to free facilities. The construction of the first time in 2012 was 4,000 SR. Thus, the total installed Gas Network (jargas) at Cirebon city as many as 7.503 SR.
"Cirebon City Gas Network (jargas) were built in the Argasunya Village, Kalijaga Village, and Harjamukti Village," said Director General of Oil and Gas, Djoko Siswanto. After the construction was completed, the city of Cirebon was managed by PT Perusahaan Gas Negara (PGN) Tbk. Gas is supplied from PT Pertamina EP of 0.2 mmscfd with tapping in the existing Pgasol pipeline network. PGN's Managing Director Gigih Prakoso added, the use of Gas Network (jargas) in Cirebon City would significantly improve the living standards of the community's economy. The city of Cirebon, aside, is one of the advanced industrial centers in West Java Province. "Through energy both cheap and stable, people will get more value," said Persih. Gas Network (jargas) development at Cirebon City is part of a construction project for households in Serang Regency, Bogor Regency and Cirebon City, West Java (SERBOCI) which the government has assigned to PT PGN Tbk. In addition to inaugurating Gas Network (jargas), the Minister of Energy and Mineral Resources also inaugurated a 575 point Public Street Lighting Solar- Power Program (PJU - TS) for the Cirebon City area, equivalent to electricity for 28 km of roads. Installation of PJU-TS in Cirebon area is in Cirebon Regency and Cirebon City with a total of 525 units of Cirebon Regency PJU-TS, 50 in Cirebon City. "This year PJU-TS installed for Cirebon City is only 50 points and for Cirebon Regency 525 points. If you still feel lacking, we suggest submitting it back to the Government. If you file it not half-hearted, count all provincial roads and national roads. That's what you submitted to us, later we will calculate how much the PJU needs, "Jonan said. "In 2019, the Ministry of Energy and Mineral Resources plans to build 21,280 PJU-TS, or equivalent to lighting the road for around 1,000 to 1,200 KM. The PJU-TS that has been built will then be managed and maintained by the Regional Government proposer," Jonan added.